I was born in New Braunfels in 1932 on Camp Street in a home built by my grandfather. My parents were Marcus and Cola Moeller Adams. I am a fifth-generation New Braunfels, Comal County, Texas, and American citizen and proud of it. It is 2006 and I have just been asked to write a column for the Herald-Zeitung newspaper and I am on my way to a meeting about the column. I left my home on Camp Street where I was born, turned left on Union Avenue towards East San Antonio Street, reflecting on the changes since I grew up in New Braunfels. At this time of year (early spring), there are no river floaters and I recalled that my swimming was done almost entirely in the spring-fed pool at Landa Park and the rapids at Camp Warnecke. I don’t even remember swimming in the Comal and never in the Guadalupe. Hinman Island was a wilderness area. Many of the homes on Union Avenue have been beautifully preserved and many are now businesses. This practice of conservation has become a satisfactory practice for homes that are now on commercial streets. Turning right onto San Antonio Street, I drove over the old bridge towards the Plaza. I decided to drive around the Plaza, just to prove that I could do it. There used to be two-way traffic around the Plaza. All the locals knew the rules, but it sure was confusing for newcomers and visitors. Driving through town on San Antonio Street, all the old buildings are there. I know those buildings because A.C. Moeller, my grandfather, built lots of them. His name is on the cornerstones as well as on the sidewalks. Of course, the beautiful Landa House on the Plaza is gone and on the corner of West San Antonio Street and Academy, one of the loveliest homes in town, the Holz home, gave way to changes that took place here in the late 1960s. That same era eliminated the Garwood home on Seguin Avenue and the bathhouse and other buildings in Landa Park. Those in town who see the value in historic buildings are fighting hard to save existing artifacts. Many people have witnessed the conversion to the “concrete and asphalt” jungle in other parts of the state. Writing this column is as close as I can get to living the life of Brenda Starr, Reporter, of the comic strip of my younger days. Her character was the inspiration that began my long-time journalistic career. In New Braunfels High School in Hallie Martin’s journalism class, my dream of being Brenda Starr was inspired when the San Antonio Light contacted her to recommend a student to report New Braunfels news to be printed in that newspaper. My friend, Phyllis Reininger and I took on the challenge. My next journalistic experience came when I was a senior and had an invitation from Helen and Joe Baldus who wanted me to write a weekly column for their newly established Town and Country News. It was embarrassingly called “Myra-Go-Round” but it could have been the launching of a history column 50 years later. I began my study of journalism at Texas Christian University, but after a year, found out that journalism was more than Brenda Starr had portrayed. I switched my major to education to be able to teach history, German and English. I met Glyn Goff at TCU and we got married in 1952. I wanted badly to move back to New Braunfels and so we did. I began my teaching career of 31 years in 1953. I had three children, Karen in 1956, Patty in 1959 and Marc in 1962. After staying home for eight years, I returned to teaching. After retiring in 1991, Rosemarie Leissner Gregory and I formed a writing partnership that resulted in the publication of three books about New Braunfels history, Kindermaskenball, Past and Present; New Braunfels, Comal County, A Pictorial History; and A Journey in Faith, the History of First Protestant Church. The last book that I wrote independently was about the Comal County Fair, It’s Fair Time. All of the research for writing these books led me to become well acquainted with the Sophienburg Museum and Archives. In 2006, Linda Dietert, Executive Director of the Sophienburg, asked me if I would be interested in writing a column about New Braunfels and Comal County history for the Herald-Zeitung. Of course, I said yes. Linda, Doug Toney and I worked out the details for a column twice a month and I have been doing that ever since for 11 years. After eleven years, people are still asking me how I come up with my subjects and the answer is simply “There is no end to history and those who make it are so interesting.” I hope you have enjoyed reading this column as much as I have enjoyed writing it. On Tuesday, May 23rd from 2-4 pm, a special event will occur at the Sophienburg. This event is the release of the book, Around the Sophienburg and it contains all of the articles that I have written over the past 11 years. It also contains the photographs that appeared in the newspaper. My daughter, Patty, painted the artwork for the cover and illustrated 26 pictures that will be on display on the 23rd. Due to the generosity of some special Sophienburg donors, the cost of the publishing of the book was underwritten so all proceeds go to benefit the Sophienburg Museum and Archives. Many people over the years have cut the articles out of the newspaper and saved them in very large notebooks. The published book contains over 250 articles and photos and is almost 500 pages. 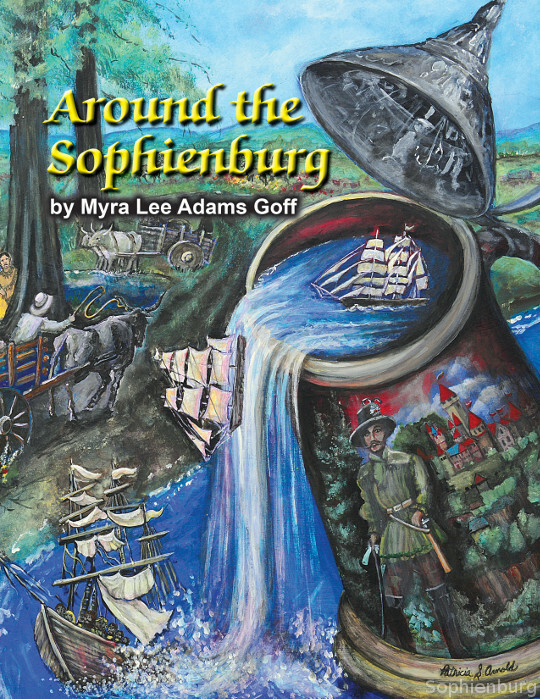 Front cover of the new book “Around the Sophienburg.” Artwork by Patricia S. Arnold.